We have a great variety of specialty and common contact lenses. Depending on each patients needs and circumstances, there may be a need to have one of the following types of contacts. Daily disposable lenses are lenses you only wear once. You start wearing them in the morning and remove them in the evening before bedtime. Simple, clean, comfortable, and hassle-free, these lenses are great for active individuals. These are also a great option for dry eye patients or allergy sufferers who get buildup or deposits on traditional lenses after several days of wear. The latest in contact lens material technology, Silicone Hydrogels are a safe, comfortable, and healthy option for active individuals who wear contacts daily. Each lens has high oxygen transfer abilities, allowing our corneas to receive the oxygen they need for proper function. These lenses may be used for extended wear, or simply daily wear with better health standards. Not all patients have simple eyes. Some patients have complex needs for contacts, which may not be available in standard contact lenses. Fortunately, we are specialists in fitting difficult and unusual contact lenses for patients. Through Wave Contact Lenses, we can design a custom contacts lens by making a map of your own cornea. Not all two eyes are alike. So, if you think you have tried all other types of contacts unsuccessfully, we may recommend a Wave Custom Lens. In the most basic of terms Accelerated Overnight Orthokeratology, Ortho-K or Wave Corneal Molding (abbreviated to WCM for this article) is the science of changing the curvature or shape of the cornea to change how light is focused on the retina at the back of one’s eye. Think of the cornea as the eye’s equivalent of a watch crystal. It is a clear, dome shaped structure that overlies the colored iris. Its tissue is most similar to clear, wet skin; and like skin it is very pliable. Because the cornea separates the eye from air and the rest of the outside world and because it has a curvature that bends light towards the back of the eye, it is responsible for most of the eye’s corrective power and contributes to various conditions such as nearsightedness (myopia), farsightedness (hyperopia), and the blur of astigmatism. When you choose WCM a few key tests must be performed. Chief among these tests is the determination that your eyes are healthy. Our doctors will examine the retina and also the health of the outside of the eye. The other key procedure is the mapping of your cornea. To do this an instrument called a Topographer is used. Just like a topographical map of a hiking area shows hills, plains, and valleys; the topography of the eye shows your doctor exactly how your cornea is shaped. The information from your corneal mapping plus the size of your cornea and the prescription needed to correct your vision are all used to design the retainer lenses or corneal molds needed to create the Ortho-k effect. Each lens is designed specifically to fit your individual corneal shape. On the day you pick up your WCM retainer lenses you will be instructed in how to insert, remove, and take care of your contacts. 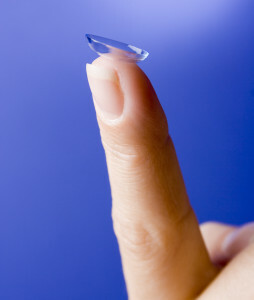 The fit of your contacts will be evaluated and you will be scheduled to be seen after your first night of wear. On day 3, your doctor will re-evaluate your fit and newly corrected vision and another mapping of your cornea will be performed. Throughout your initial fitting period, your Orthokeratologist will monitor your corneal health and the effectiveness of treatment. At certain times your retainer lens fit may be modified to achieve your goals. We advise patients that they may need to use their retainer contact lenses every night to maintain their newly corrected vision although some patients are able to vary their wearing time to once every two to four nights. The reason for this is due to the flexibility of your cornea. To get a sense of how this all works, just remove a ring from one of your fingers. You may notice an indentation where the band was. In a way, you’ve been doing “orthokeratology on your own finger”. Over time if you stop wearing your ring this indentation will go away. Ortho-k has a similar effect on your cornea; stop wearing your retainers and your cornea and your vision will return to their original state before treatment. And that’s really the beauty of Orthokeratology; it is the NON-SURGICAL, NON-INVASIVE, FULLY REVERSIBLE alternative to refractive eye surgery! Myopia Progression: One final note is regarding children and their use of WCM lenses. For children who genetically would be having frequent lens changes due to myopia (or nearsightedness) progression, WCM can be a great option to reducing this increase. While a child is wearing WCM, their prescription remains stable. When they stop wearing their retainer lenses, their myopia will continue to progress from where they were when they started with treatment. For example, if in 2006 a child has a prescription of -2.00 and by 2009 his prescription has increased to a -5.00 in each eye, that same child if undergoing WCM since 2006 would still have a prescription near -2.00 in 2009 when he was reevaluated. If the child or parent decides to stop the treatment, his myopia will now begin to increase, just 3 years behind the trend it would have seen when not wearing WCM lenses.